I’m Cindy Pearson Cole. I’m a Wisconsin-born Iowa Midwesterner with Arizona roots; I’m a daughter, friend, wife, mom, stepmom, and grandma. I am a healthy living and plant-based diet advocate, a writer, editor, and mediator, in sum a creative and helper type. For many years I was a magazine writer and editor for a major publisher, many of those years as a food editor, working with a bunch of celebrity chefs. Ha! All of it was fun and gave me a great perspective on how we all do food. I’ve worked in healthcare, home and garden arts, even fashion for a blink, and human services. I love adventuring outdoors, or sinking deep into a project. I get to do both often as I live in the country with my husband; given we grow as much of our own food as possible, and as plant-eaters, that’s a lot of food! With my husband Erin, I’ve been doing a whole-food plant-based oil-free diet now for more than five years — my best decision EVER — all the while continuing to study, learn, and talk with others who are regaining their health. Me and my beloved plant-based partner, at a music festival. 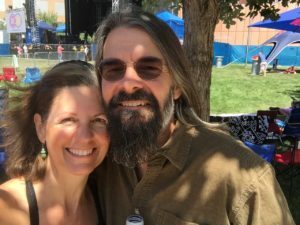 To read about how my husband and I made the shift to whole-foods, plant-based eating, see From Eggs ‘n Cheese to Plant Foods and Personal FAQ, both under the About tab.